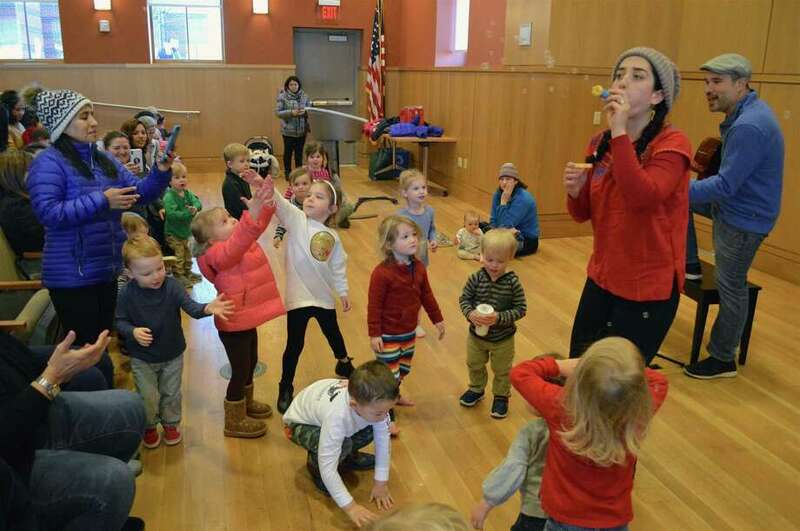 A bubble spectacular was among the happy moments at the Bilingual Birdies concert at Darien Library, Friday, Jan. 11, 2019, in Darien, Conn.
DARIEN — A couple of melodic songbirds got Darien Library moving Friday morning when Bilingual Birdies flew into town. “As an artist it’s very fulfilling for us,” said guitarist Marilyn Castillo, who traveled from New York City with accordionist George Saenz to perform. “We get a very loving audience,” she said. Castillo has her own Mexican fusion band in the city called Adderesound, while Saenz performs with Lila Downs, a well-known Mexican singer-songwriter. The two led a range of interactive songs, incorporating Spanish and English, which had the audience of toddlers and their caregivers dancing and singing along. “It’s a great opportunity for caregivers and children to come to the library and enjoy a program everyone can participate in,” said Samantha Cardone, children’s program coordinator. The duo will return to the library on Jan. 25.